How has eclipse season been going? To recap we, had a solar eclipse in Virgo back on Sept. 13. September 17, Mercury turned retrograde. Wednesday, September 23 signaled the Autumnal Equinox and the Sun changing signs into Libra. So tonight is kind of a grand finale to a lot of activity, yet we’re still in Mercury retrograde through Oct. 9. What the heck does this all mean? Well, back at the solar eclipse, which is a super-powerful new moon, we had the chance to set some big goals. Because it was an eclipse and not just a regular new moon, our intentions can reverberate for the next six months and if you happen to be a Virgo or have a lot of Virgo in your chart, this could kick off a new cycle for the next year. But then Mercury turned retrograde, reminding us of all the stuff we need to take care of from the past before we can move forward. It’s kind of like getting really excited about moving into a new house but having a month of packing and cleaning up the old house ahead of you. New, exciting things do lie ahead, but we must wait a little more. The Autumnal Equinox is a good time to take stock of the year so far. It’s the half way point in the astrological calendar and creates a mood of preparing to “hunker down” for the colder, darker days ahead. Keeping with the moving analogy, this is the part where you might make your “to do” list of what needs to get done to move forward. And, don’t forget to pat yourself on the back for the things that have being accomplished. You wouldn’t be planning a metaphorical move if you hadn’t been doing some work!! So tonight the energy all comes together and can feel like a rebirth of sorts. It’s obvious that changes are going to occur and the momentum is too strong now to stop them. If you have been focusing in on a new vision, tonight can be used to identify what you need to let go of in order to allow space for your new ideas to take root. Even if things don’t seem so clear, but you’re ready for a change, it’s a great time to feel sure about what you don’t want. You can then begin the process of elimination needed to see what you do want. Tonight’s full moon eclipse in Aries can help you feel in touch with your passions and get inspired about what really makes you feel on fire with life. If you’ve been drifting, searching or questioning, this is a good time to feel a spark and move towards the light. Because Mercury is retrograde, it’s possible the realizations that ignite your enthusiasm are related to ideas you’ve had before. Did you previously talk yourself out of a “crazy idea” because it wasn’t practical, easy or in alignment with other people’s expectations? Might be time for another look. 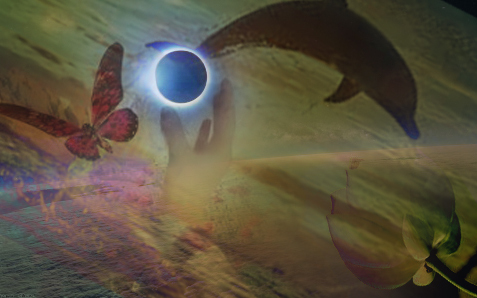 Use tonight’s full moon eclipse energy to reimagine your life and release old patterns of negativity or limitation. Some people may be feeling on track right about now. I am happy to report that I am among that group. My intention for tonight is to rededicate myself to all I’ve committed to that I know is fulfilling and part of my life’s purpose. Just because I’m on path doesn’t mean it’s not work and I could use a little boost to remind myself that patience, dedication and steady devotion to a life worth living is, well, a life worth living. Happy full moon eclipse, everyone!